UPDATE: Awwww, I am so overwhelmed with all your Comments about my one pitiful bowl! Thank you sooo much! I "puddled" up at several of them :-) Beyond your Comments, this day has not gone well. I'm in Kansas and my friend came through surgery well and will come home tomorrow, but when I got back from the hospital, I spent 30 minutes on the porch trying to get the door open - I finally got ahold of her daughter who gave me the "trick" for unlocking the door. Then I discovered my charging cable for my phone got fried on her old-house-electricity. and so the only way to charge my phone is to sit in her truck with the engine running (my car will charge without the engine running). And to rub salt in the wound, I can't get her kitchen range lit to cook some dinner. Don't know whether she's out of fuel, or what? I called her daughter again (she's my "new best friend") and she said it should just light right up, but it doesn't. I think I should just go to bed and hope tomorrow is a better day, BUT the good news is my friend is doing well, so I guess that's what really matters. 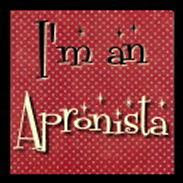 Thanks again for all your wonderful, uplifting Comments - I appreciate them sooooooooo much!!!!! I signed up for the Bowls with Borders Blog Hop that I heard about over on Sew WE Quilt (a fabulous blog if you've never been there!). 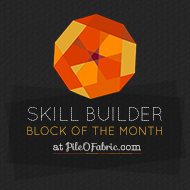 This was a paper-piecing blog hop and the pattern was generously provided by Regina. NONE of which I was, this time around! So without further adieu (and actually, it doesn't even deserve ANY adieu to begin with! ), here is my one, poor, pitiful little bowl. 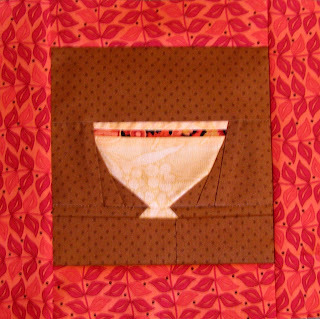 Your bowl is lovely....I was also a bit intimidated by all the other quilters, but I am glad that I gave it a try. Sorry about your cell phone/vacation interruption! Yay! your one bowl is very cute. well done! One bowl is better than not finishing, so chin up. And just love that border fabric - a real stunning frame for your bowl. Oh no, I like you bowl. I think you did a wonderful job. Half the fun is trying! Thank you for sharing. I love your bowl. Don't you think it would make a lovely hot pot holder? You should be very proud of your bowl, it is lovely! What can I say, you made your first bowl. Yeahhhh! Your bowl is great. But only one? Yay for your one bowl it looks wonderful.. Cute little bowl! One bowl in better than no bowls. :) Thanks so much for sharing. Your bowl is cute and I must say, you have one more bowl than most of us!! You do what you can, when you can, and it's more important that you are helping your friend then creating a stack of bowls! Life happens, we just keep stitchin'. There's a little song that just popped into my head from YEARS ago (with a little change): The bowl stands alone, the bowl stands alone, hi-ho the dairy-o, the bowl stands alone. See? It worked! It's better to make one bowl than to curse the darkness (again, another saying slightly changed). You go, girl! You met the challenge!!! You showed up with all that is occurring in your life. Congratulations. You made your one bowl, it looks great! Don't be so hard on yourself...Life happens and we all experience it. You kept to your commitment and that's what we all respect. Well done, bowl and all. Life sometimes happens and our plans change.... Your single bowl is wonderful! Happy quilting! Your bowl is gorgeous.Don´t worry,you did what you can .Here it said:"Man proposes , GOD disposes". Hope things are going better. Very cute! Love your post. I like your one bowl and the name is priceless...ta friggin da? gotta love it! 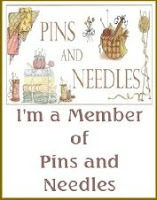 Quilters know that it isn't the SIZE that matters.... it's the love putting it together!! (And we all have made plans,and then life happens!) It's cute!! It is not the quantity but the quality. I think your single bowl is beautiful. We can;t always get as much done as we would like. That is why I did a runner and not a large stack. But your piece looks wonderful; great work!! Your bowl is really pretty though. I love the background color and the red border as well. This was fun to do, huh? well done! I think your bowl is cute! I hope things work out better for you. At least you made an effort. Really cute colours. Sometimes the time flies by. It is a cute bowl :) Maybe when things settle you can make some friends to go with it? You got -r- done . and that's what counts and best of all you shared with us all and it is a cute little bowl at that. Your little bowl is so pretty! Simplicity is often elegant, right? I like your one bowl , especially the colors. Makes a really cute topper. Very nice bowl. Really love that red border. Thanks for sharing. Well, it's a wonderful bowl. Well Done! One little bowl is way better than no little bowl. At least it is very cute, has potential, and you learned something. Way to go! Enjoy Kansas and thank you for hopping with us! It's been fun! What a beautiful bowl and with everything you have going on it was amazing you had time to make it! Thanks for sharing! Your bowl is not pitiful at all...it is wonderful and don't let anyone tell you otherwise. Ya don't need them stacked to the ceiling to be fun and to have had an opportunity to do some paper piecing. I did not sign up to do this blog hop because I do not enjoy paper piecing much. I have done some, but I don't like the process. I have done the past 2 blog hops and have signed up to do the next two, but just knew this one wasn't my cup of tea. So making one bowl, well that would have been all I would have done too. But that doesn't mean that you should feel intimidated. You did a great job and tried it and that's all that you needed to do. Your bowl is beautiful. Oh Nadine you are too much. There's a saying - beauty in simplicity. I'm thinking of all the possibilities for what could be in your bowl. Hope your friend is better. Thank you for the post! That is such a pretty little bowl! Thanks for the smile today! I was touched by your honesty, humour, and effort. Hopefully your bowl of blessings will be filled with better things in the months to come! I like your red bowl; it would be a perfect potholder, don't you think? And, good for you, to keep a commitment despite life getting in the way. Thanks for sharing! As someone who did not participate in this blog hop because I am afraid of paper piecing, I think your bowl is just lovely. Thanks for sharing. Lovely work! I am in the same "bowl" as you so don't beat yourself! You made it and you shared it; thank you! One bowl of water can save a life. It's not pitiful at all!I like it! funny. You did it! Great story by the way. I feel you with the pressure :) I only made one bowl too, but it was my first paper pieced project, so it is a step in the right direction. Congrats on getting your bowl done. I really like your one bowl. It is peaceful and that is something i am craving at this time...Thanks for sharing! Great colors. Your bowl is set off nicely. Sounds like your bowl is full! LOL! You tried paper piecing which is something I don't think I would like. 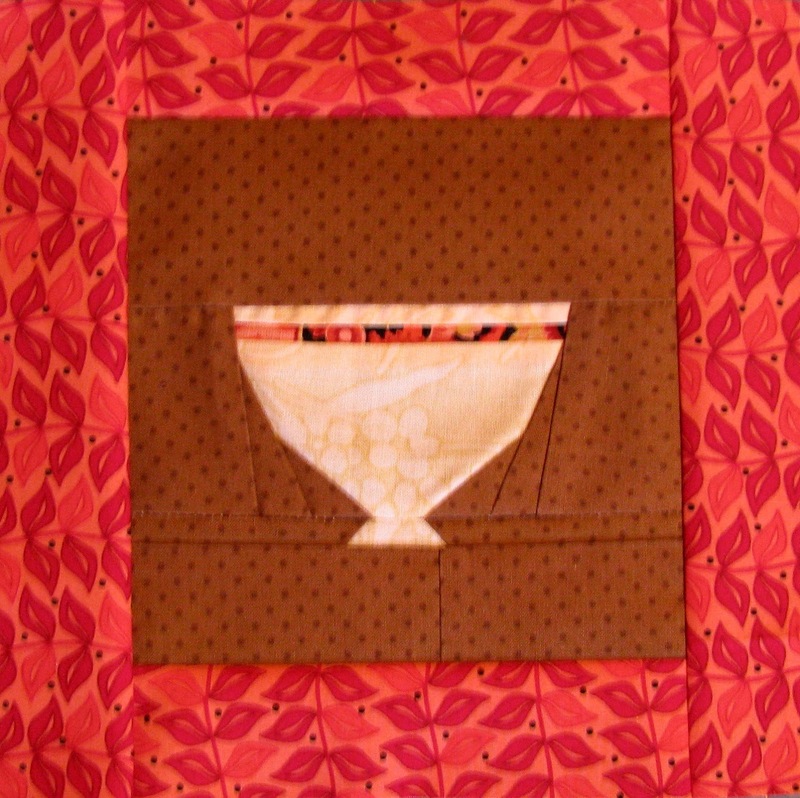 I like your bowl - the contrast between the quilt border, background, and bowl rim is lovely. You did well for being so pressed for time. Thanks for the stop. I like it, I like it! and if you said that you had run out of fabric, well, nobody would believe it! Love your post! It's a great block, no number of bowls listed in the guidelines so it qualifies. It's a special, one-of-a-kind bowl and very nice! I think I have that border fabric in green. I love your bowl and its border! I'm trying to get up the courage to join in on one of these hops! And think, you can make another bowl or two and have a group of bowls!!!!! I love your bowl!! It's beautiful!! Thanks for sharing it with us!! I love your bowl : ) Thank you for sharing. Oh my word girl, it may be one bowl, but you have a heart of gold, and your fabric choices are super! I think your single bowl is very sweet. I was sorry to read about the difficult day you've been having and hope that tomorrow will go more smoothly. Some days are just rough! I think your single bowl is quite pretty, Nadine. Sorry you've been having a difficult time recently, hope things get better. Thanks so much for being a part of this hop. I am sorry your day was rough, but I think taking care of a sick friend is a wonderful thing to do. I love your little bowl and hope tomorrow is better. There is a quiet stillness to your bowl which I assume is your intuition's way of saying "I need stability!" Your bowl is perfect for you right now--it cannot be compared to others as they do not lead your life! You did a great job with your pretty little bowl! Hope this day goes well for you! I understand being intimidated by other quilters so many of these hops bring together people of such various levels of talent. BUT, do not sell yourself short, Your bowl turned out perfect, if almost looks like you lined up the dots! I hope you have signed up for another one of the hops, because it can only get better! I love the simplicity of one bowl! There is so much more you can add...or not...up to you. Thank you. Nadine....you did good, your one bowl is better than no bowl. Hope your days are much better....thanks for sharing, have a great week!! Your bowl is very fine, great colors and like you said bordered. I think I saw some that weren't. Mine top almost wasn't. Then I finished and midmight and could not get pictures posted to my blog, (rural internet issues) so my post was late late late. You Agent Q10 finished on schedule, so your mission is complete. You get an A!! Am hopping by late because am still haveing internet issues but I am determined to get by everybody's even if it takes a month! After reading all your trouble, well you've done it anyway! A bowl is a bowl is a bowl. It doesn't matter if it's one or many. You participated in the hop, and I thank you for sharing! I knew I should take a break from "apron swapping" when I mailed a swap out and started to write my return addres (which SHOULD be "123 Apple Valley Rd") on the mailing package as "123 Apro..." LOL! 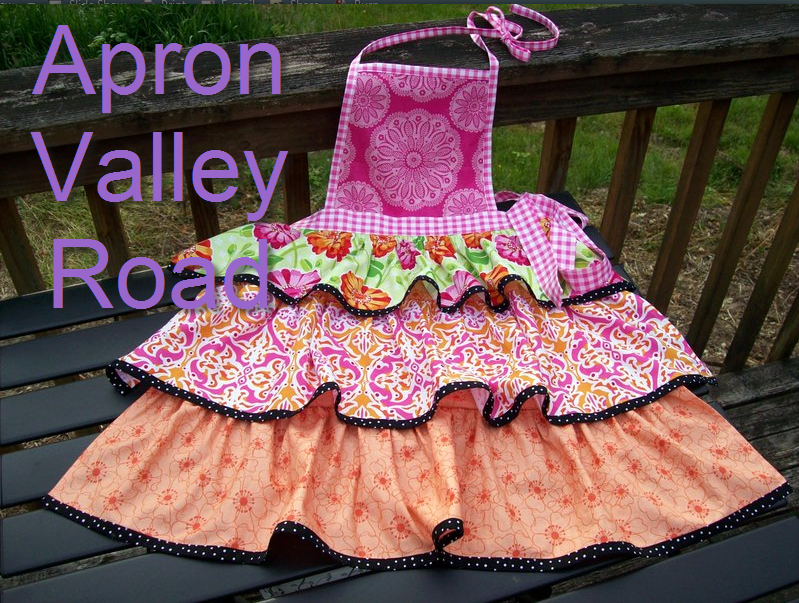 I couldn't think of a name for my blog, but when I told the story to my son, Ben, he said I should call it Apron Valley Road, and of course, he was right!